Sacred literature demands the reader carefully engage not only the text itself but great and eternal principles. One simple method of active reading is to utilize the ‘look for’ method. After many years of such engagement, Jared Demke began to notice specific repeated themes, usually in a certain order. He noticed, for example, that soon after passages where sacred promises and covenants are described, later in the chapter one would find beautiful verses on how those same promises are fulfilled. He also found that when covenants are introduced, within a few verses one would often find verbiage having to do with how we find ourselves living in and dealing with the trials and tribulations and troubles of a sometimes hostile world. Then later in the same chapter or book, he noticed that the theme was repeated, where instruction was given on how we might overcome the world. He also noticed another related theme having to do with how we should act as one of the Lord’s servants here on earth – effectively drawing down the blessings of heaven. Jared began to document the pattern of these repeated themes – found in almost every Old and New Testament book, in the Book of Mormon, and in most other sacred literature. He documented six major elements of parallel repeated themes. Sometimes these themes would be direct parallels, for example, themes ABCDEF, ABCDEF. 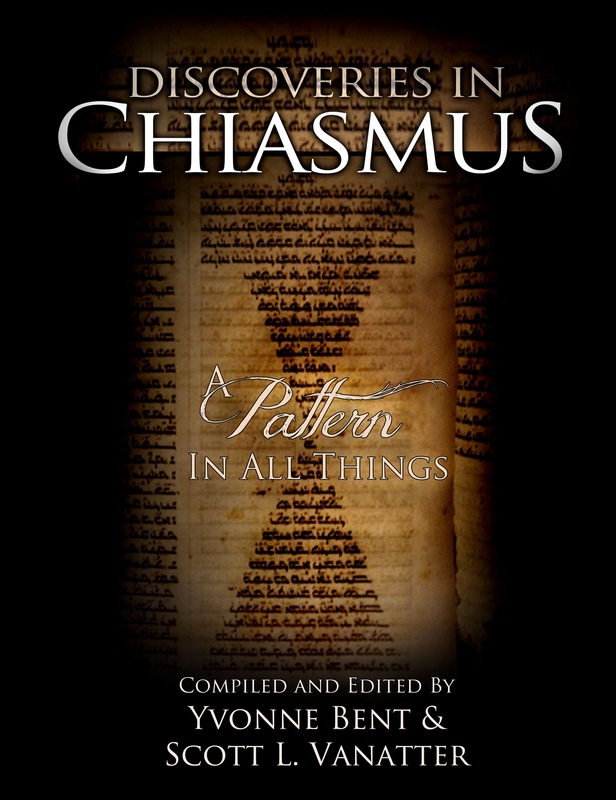 In other cases the second set of repeated themes would be in reverse order – an inverse parallelism, or as it is known among biblical scholars by the Greek term, chiasmus. The themes would begin ABCDEF, but the second set of parallels would be found in reverse order, FEDCBA. Altogether, we have together documented hundreds of examples and published a couple hundred online. In what turned out to be the last five years of his life, we spent time refining the presentation of the pattern. However, we purposely let our thoughts percolate rather than publish too early. Jared focused even more on his young family. We learned more, read more, and experienced more of sacred things. I was privileged to work alongside him and collaborate with him in this effort—one of the most intellectually and spiritually satisfying (and fulfilling) aspects of my life. It informs all other aspects of my life, my love, my service, and my perspective on life and the eternities and the Divine. The very center of these chiastic examples (or the endpoint of a six-element parallelism) would usually be a poignant description of Jesus and how he suffered for us; how dearly he loved us; how we can/should identify with Him; and how—most beautifully—one day we would be “encircled about eternally in the arms of his love.” In the 1996 General Conference, Elder Russell M. Nelson described this aspect of the Atonement, thusly, “Closely related is the Aramaic and Arabic word kafat, meaning ‘a close embrace,’ no doubt related to the Egyptian ritual embrace. . . . [Another Book of Mormon passage] proffers the glorious hope of our being ‘clasped in the arms of Jesus.’ I weep for joy when I contemplate the significance of it all. To be redeemed is to be atoned – received in the close embrace of God. . . .” One of the inspiring filters he outlined was to read the Davidic pattern through the lens of Temple Imagery. Below is presented a side-by-side comparison of two of those filters, the outer (the original Davidic template) with the inner (The Mythological Journey Inward). Over time I will make most of the content of the original website available in this new one. Compiled and edited by Yvonne Bent and Scott L. Vanatter — with chapters authored by Denver Snuffer, Greg Carlston, Scott L. Vanatter & Jared R. Demke, Mark A. Shields, Lenet Read, Kathryn Paulsen, Val Brinkerhoff, and Yvonne Bent. Click link below to order the new book’s second edition available at Amazon.com and Deseret Book online. Chapters were authored by presenters at the related conference held in Utah in late 2010. Chapter two is on Davidic Chiasmus and Parallelisms, with content taken from this website written by Jared Demke and new observations and material written by me. Jared and I last actively updated our original website late in 2001. Between 2002 and 2006 we would alternatively ponder then discuss how we would improve our presentation of the Davidic pattern. When we began pulling together our thoughts in 1995, we envisioned writing a book on the twenty best examples of the pattern — from the book of Psalms. This first book would be for a general audience, not just for Mormons. We had several other books in mind, on a thousand related topics. Immediately below this post can be found our original Introduction. Below that, is a draft (only a second draft, we intended more refinement before we would publish) reflecting our expanded thoughts as of late 2005. I have titled this piece, “The Journey Inward.” Jared’s untimely passing in 2006 cut short our desire to more perfectly present where we were felt we were being drawn. Lastly, we planned to remove certain of our original examples of the pattern presented in our first website. This, till we could invest the time needed to improve them to more perfectly conform to the thematic pattern. I have now begun the process of cleaning up many original examples of the pattern. I have started with Joseph Smith’s ‘King Follett Discourse.’ As our webhosting company has shut down all geocities.com URLs, I have created this new URL as the new home for Davidic Chiasmus and Parallelisms. Over time, I will continue to update this website with the best examples of the pattern, including most of Jared’s exposition on how to understand it. This, of course, will take time. If any reader desires access to one of the many examples not yet updated, please post a request and I will prepare it for publication on the site, or send it directly to you. Thank you for your patience as I work through bringing this new website up to the higher standards Jared and I desired. This type of mystical interpretation looks beyond the pairs of opposites. As the poet William Blake notably pointed out: “If the doors of perception were cleansed every thing would appear to man as it is, infinite.” Therefore, a whole new set of Davidic titles is also required to get our minds focused on man’s inward spiritual state. This fourth level of interpretation should be able to take us to the transcendental center and not simply to another point on the physical circumference. Our original state of innocence/slumbering: We are unaware, unknowing, and mostly in ignorance of the divinity that is deep within us. Inner feelings of being awakened from a deep sleep: and having a great yearning, and desire to approach and explore. If one has the courage to continue on to the potential of something better, there will be overwhelming incredible and sometimes terrifying experiences that changes one’s existing paradigm. Inner feelings of being separated, unconnected, fragmented, and alone in the world (error, darkness). Terrifying, dark, chaotic encounters within the pyche. Deep retreat in time and space. The world does not communicate to us and we do not communicate to the world. This “Waste Land” condition (described by T.S. Eliot) constitutes a disassociation of spirit from nature. Inner feelings of being reunited, connected, together with those in heaven. A wholeness manifested (truth, light). This healing can only be attained by the light/spirit of: 1) spontaneous compassion, 2) a passion or lust for life, and 3) enduring sublime love. Everything is accomplished by the impulse of one’s own true nature; nothing borrowed, nothing counterfeited. Inner feelings of receiving gnosis, knowing, intuition, love. The opposing gates of fear and desire are boldly passed through. Inner feelings of receiving comfort, grace, beauty, and wonder. “Privation and suffering alone open the mind of a man to all that is hidden to others.” These centering harmonious feelings are reached through the noble experience of joy in a world of suffering. Becoming perfect, fully confident in one’s standing/relationship with the lord, comforted in all things. Independent of the feelings others place on you; no malice expressed and nor offense taken. Feelings of being full of light with the power and courage to bestow blessings to fellow men. Gratitude and awe of the Infinite. These new powers are experienced both in control over one’s own situation and influence with others. One becomes a creative center of the life/light process. A rebirth to life. All desires and all yearnings are fulfilled. We are re-introduced back into the Garden. Fully conscious, fully knowing, fully creative, spontaneous, and living from the center. Four trenchant examples of that would serve to illustrate this anagogical methodology are from Ralph Waldo Emerson and Walt Whitman, both in style and in prose. If we cannot at once rise to the sanctities of obedience and faith, let us at least resist our temptations; let us enter into the state of war, and wake Thor and Woden, courage and constancy, in our Saxon breasts. This is to be done in our smooth times by speaking the truth. Check this lying hospitality and lying affection. Live no longer to the expectation of these deceived and deceiving people with whom we converse. A — Say to them, O father, O mother, O wife, O brother, O friend, I have lived with you after appearances hitherto. Henceforward I am the truth’s. B — Be it known unto you that henceforward I obey no law less than the eternal law. D — but these relations I must fill after a new and unprecedented way. E — I appeal from your customs. I cannot break myself any longer for you, or you. F — If you can love me for what I am, we shall be the happier. F’ — If you cannot, I will still seek to deserve that you should. E’ — I will not hide my tastes or aversions. that I will do strongly before the sun and moon whatever inly rejoices me, and the heart appoints. if you are not, I will not hurt you and myself by hypocritical attentions. B’ — I will seek my own. I do this not selfishly, but humbly and truly. A’ — It is alike your interest, and mine, and all men’s, however long we have dwelt in lies, to live in truth. Does this sound harsh to day? You will soon love what is dictated by your nature as well as mine, and, if we follow the truth, it will bring us out safe at last. But so you may give these friends pain. Yes, but I cannot sell my liberty and my power, to save their sensibility. Besides, all persons have their moments of reason, when they look out into the region of absolute truth; then will they justify me, and do the same thing. A — I read the other day some verses written by an eminent painter which were original and not conventional. B — The soul always hears an admonition in such lines, let the subject be what it may. C — The sentiment they instil is of more value than any thought they may contain. D — To believe your own thought, to believe that what is true for you in your private heart is true for all men, — that is genius. E — Speak your latent conviction, and it shall be the universal sense; for the inmost in due time becomes the outmost,—— and our first thought is rendered back to us by the trumpets of the Last Judgment. F — Familiar as the voice of the mind is to each, the highest merit we ascribe to Moses, Plato, and Milton is, that they set at naught books and traditions, and spoke not what men but what they thought. E’ — A man should learn to detect and watch that gleam of light which flashes across his mind from within, more than the lustre of the firmament of bards and sages. C’ — they come back to us with a certain alienated majesty. B’ — Great works of art have no more affecting lesson for us than this. They teach us to abide by our spontaneous impression with good humored inflexibility then most when the whole cry of voices is on the other side. A’ — Else, to morrow a stranger will say with masterly good sense precisely what we have thought and felt all the time, and we shall be forced to take with shame our own opinion from another. Friends, kindred, days, Estate, good fame, Plans, credit, and the muse; Nothing refuse. D — But ’tis a god, Knows its own path, And the outlets of the sky. Such ’twill reward, They shall return More than they were, And ever ascending. Keep thee to day, To morrow, for ever, Free as an Arab Of thy beloved. D’ — But when the surprise, Vague shadow of surmise, Flits across her bosom young Of a joy apart from thee, Free be she, fancy free, Do not thou detain a hem, Nor the palest rose she flung From her summer diadem. Heartily know, When half gods go, The gods arrive. And as to you death, and you bitter hug of mortality . . . . it is idle to try to alarm me. F. . . . who there can be more wonderful than myself. B. And as to you death, and you bitter hug of mortality . . . . it is idle to try to alarm me. D. I see something of God each hour . . . each moment . . .
C. Why should I wish to see God better than this day? Jared R. Demke, 49, died of a sudden heart attack in the early morning hours of Sunday, October 8, 2006. So thankful am I for the love and perspective of thirty years of close friendship. For more than fifteen of those recent years, my wife and I have been privileged to have Jared stay with us in our home in northern Virginia, during his usual twice-a-year business trip to the DC area. When not visiting in person Jared and I would talk on the phone — often. Ginger related to me that one of his friends commented that talking with Jared on the phone was like going to Disneyland. I wholeheartedly agree – the printed theme on the sign outside Disneyland is “The Happiest Place on Earth.” That’s Jared. He brought prodigious amounts of happiness and shear joy — and light and hope — to all he met and loved. For many of those years we spoke on the phone daily, and not for just a few minutes. On the phone and during his visits, almost constantly over these thirty years we have debated and discussed — at great length and in great detail – the things of eternity, the trials and joys of this world; the deepest and even the silliest of things; book things; political things; fun things, movies, music, art, and comedy . . . everything. But, more and more in his the past few years, family things. We focused our talks on the centrality and great value of the family. Especially the past handful of years, he spoke increasingly of the great joy in loving his dear family. Somehow he was drawn to invest extra time with his family these past few years. I bear witness from first-hand experience that Jared not only pondered the things of God and communed with God — he saw and could communicate to our hearts those beautiful, eternal things. When in Virginia, he and I would spend Saturday afternoons visiting George Washington’s Mt. Vernon, the Civil War battle sites in Richmond, Bull Run/Manassas, Antietam/Sharpsburg, and especially Gettysburg. We’d visit new mega-bookstores and small, used bookstores hunting out new and old books of all types on religion, biography, and history. But Jared had MANY favorite quotes and ideas floating in his mind and heart. Too many to cite here. We visited Gettysburg together several times. Each time we visited we would recite Lincoln’s Gettysburg Address. You might also know of the hero of the second day of Gettysburg, college professor, and future governor, Joshua Lawrence Chamberlain. He and those he commanded from the state of Maine were given the command to hold “at all costs” the left side of the Union line – on Little Round Top, the hill on the left side of Cemetery Ridge. Southern troops from Texas and Alabama made several attempts to flank the Union line. If they had been successful, southern canon could have been put on top of Little Round Top and decimated the Union line. After holding up under several southern attacks, but then ultimately running out of ammunition, Chamberlain ordered the remaining troops to “fix bayonets” and they charged down the hill to force the southern troops off the slopes of Little Round Top and finally force them back into retreat. Our church teaches–as other organizations–that when we study, for example, the scriptures, we should use the “Look For” method of active reading. This method forces us to listen more carefully, and be on the look out for key principles and important, eternal themes. Jared not only practiced active reading, but over ten years ago, after many years of in-depth study and introspection, he noticed certain repeated themes, usually in a certain order. He noticed, for example, that soon after the passages where sacred promises and covenants are described, later in the chapter one would find beautiful passages on how those same covenants are fulfilled. He also found across many books of scripture, that when covenants are introduced, within a few verses one would often find verbiage having to do with how we find ourselves living in and dealing with the trials and tribulations and troubles of the world. Then later in the same chapter or book, he noticed that the theme was repeated, where instruction was given to us on how we might overcome the world. He noticed that another theme usually had to do with how we should act as one of the Lord’s Servants here on earth – effectively bringing down the blessings of heaven. Jared began to document the patterns of these repeated themes – found in almost every Old and New Testament book, in the Book of Mormon, and in most other sacred literature. He documented six major elements of parallel repeated themes. Sometimes these themes would be direct parallels, for example, themes ABCDEF, ABCDEF. In other instances the second set of repeated themes would be in reverse order – an inverse parallelism, or as it is known among biblical scholars, by the Greek term, chiasmus. In these cases, the themes would start out ABCDEF but the second set of parallels would be found in reverse order, FEDCBA. Altogether, we have documented hundreds of examples and published a couple hundred of them online. We have spent the past five years of his life behind the scenes (off and on) refining the presentation of the pattern. However we had purposely let it percolate, rather than publish it too early, as we focused more on family life — learned more, read more, and experienced more of sacred things. I was privileged to work along side him and collaborate with him in this effort… one of the most intellectually and spiritually satisfying and fulfilling things of my life. It informs all the other aspects of my life, my love, my service, my perspective on life and the eternities and Divinity. Among other important templates, Jared’s most inspiring filter was to read all these patterns through the lens of Temple Imagery. In my mind’s eye, I can see Jared on the other side of the veil waiting and preparing for his family to arrive (for us all to arrive…). “. . . [Ginger], my love for you is deathless, it seems to bind me to you with mighty cables that nothing but Omnipotence could break . . . . The memories of the blissful moments I have spent with you come creeping over me, and I feel most gratified to God and to you that I have enjoyed them so long. And hard it is for me to give them up and burn to ashes the hopes of future years, when God willing, we might still have lived and loved together, and seen our sons [and daughters] grow up to honorable manhood [and womanhood] around us. . . .
“My dear [Ginger], never forget how much I love you, and when my last breath escapes me . . . , it will whisper your name. . . . How gladly would I wash out with my tears every little spot upon your happiness, and . . . shield you and my children from harm. But I cannot. I must watch you from the spirit land and hover near you, while you buffet the storms with [our] precious [children], and wait with sad patience till we meet to part no more. “But, O [Ginger]! If the dead can come back to this earth and flit unseen around those they loved, I shall always be near you; in the garish day and in the darkest night — amidst your happiest scenes and gloomiest hours — always, always; and if there be a soft breeze upon your cheek, it shall be my breath; or the cool air fans your throbbing temple, it shall be my spirit passing by. I pray that sorrow at the loss of Jared’s ongoing immediate impact in our lives will be tempered with a constant, fond, loving, and effectual remembrance and continuation of his joy for life and his zest for living. Most Examples of the Pattern were outlined by Jared Demke, with minimal input from Scott Vanater. Those examples marked with an asterisk (*) were outlined by Scott Vanatter, with minimal input from Jared Demke. Examples marked with a double asterisk (**) were outlined with significant participation by both Jared Demke and Scott Vanatter. The original website was last updated on 16 August 2001.